The Best Things to do in Girona Spain - A Detailed Guide to Visiting! 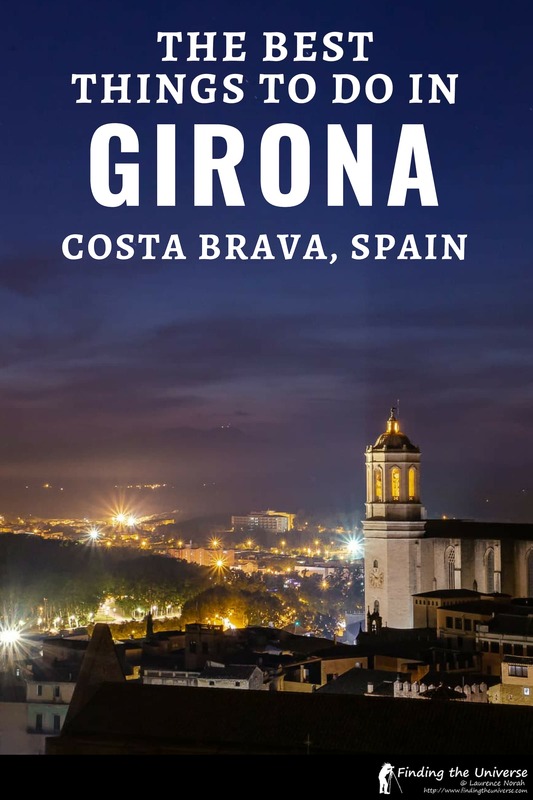 Home » Destinations » Europe » Spain » Things to do in Girona, Costa Brava – A Detailed Guide! Girona is a wonderful small city which is very popular to visit as a day trip from Barcelona. However, there are more than enough things to do in Girona to fill a number of days, and we have visited a number of times and always find more to do! 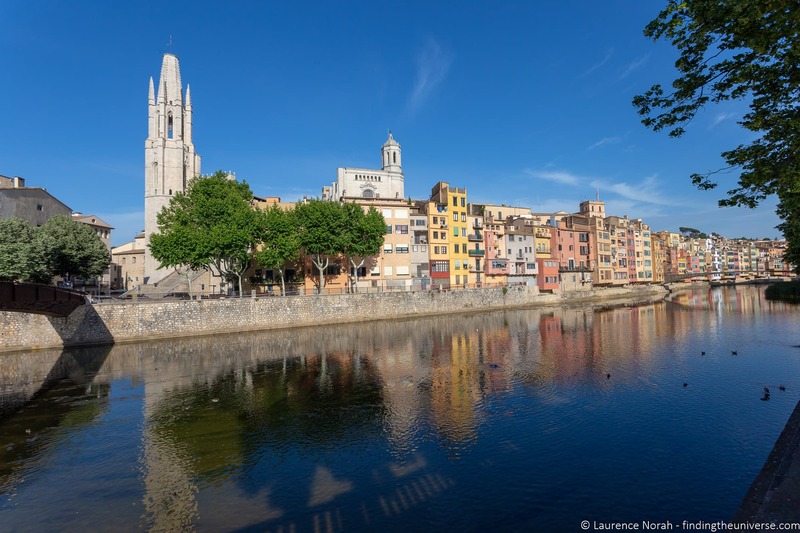 This guide to things to do in Girona will help you plan your visit, be it for a few hours, or, ideally, for a few days. There is a lot to do in the city, from visiting the well preserved medieval old town, to exploring one of the many museums, to eating at one of the world’s best restaurants! Girona also makes an excellent base to explore the surrounding Costa Brava and Pyrenees regions of Catalonia, and we’ll link to a number of posts and provide resources to help you make the most out of planning your whole adventure in this area! First though, we’re going to take a look at all our favourite things to do in Girona Spain, based on our time spent there. As this post will make clear, there is a lot to do in Girona. If you are only here for a few hours as part of a day trip, we’d suggest picking a few of these – perhaps visiting one museum, walking the Jewish quarter, and heading up to wall a section of the walls. If you are lucky enough to have longer in the city, then you will be able to explore more. In terms of order, this guide is roughly ordered in a route that starts from where most day trippers would start, in the bus parking area next to the Pont de Sant Feliu. Being a medieval city filled with winding streets, it’s not easy to make a perfectly logical walking route around the city, but as a rough idea it should be a start! If you are visiting Girona on a day trip, there’s a high chance that your bus will drop you off in the main visitor bus parking area, which is by the river under the railway bridge, and next to Pont de Sant Feliu. This is a pedestrian bridge across the river which leads you into the oldest part of the town where you will be spending the majority of the day. Before rushing across the bridge though, you’re going to want to take a bit of time here to admire the spectacular Girona skyline, as well as a row of wonderfully coloured houses which line the Onyar River here. On a calm, still day, these houses reflect beautifully in the water, and you’re definitely going to want to grab your camera and get a few photos from this spot! 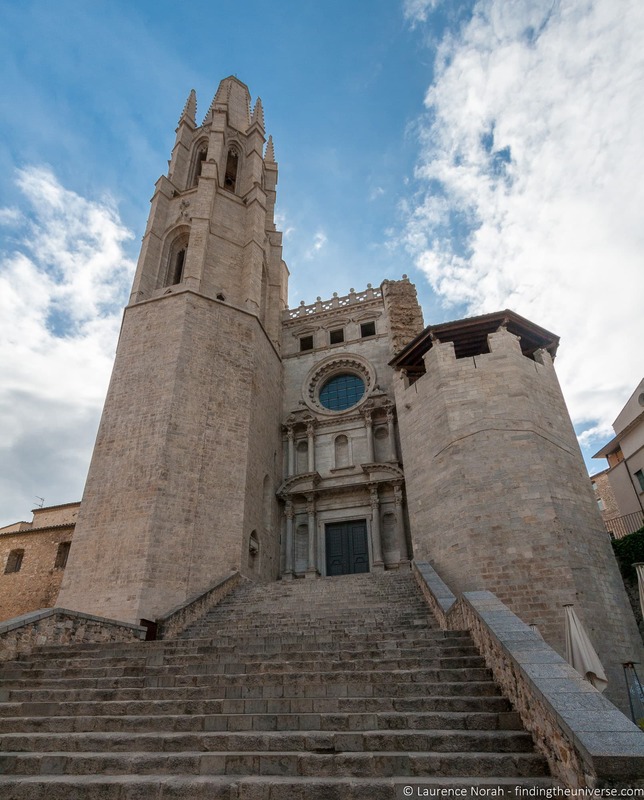 Once you cross the Pont de Sant Feliu, you will see the Basilica de Sant Feliu, set atop an impressive set of steps. This was the first cathedral of Girona, and is largely built to the Romanesque design, as with many churches in the Catalonia region. However, it does feature a Gothic nave and a Baroque facade, which were added later. Inside, the basilica is home to the tomb of St. Narcissus, patron saint of the city, as well as eight other tombs which date from the 3rd and 4th centuries, and are of Roman and Christian origin, as well as various important Christian artworks. Note there is a fee to visit, but this does include an audioguide, as well as entry to the Cathedral de Santa María de Girona (see below). See the official website for pricing and hours. As you continue up into the city and through the massive city walls, you will come to the city’s main Cathedral – the Cathedral de Santa María de Girona. This has an even more impressive set of steps leading up to it, and a photo of yourself on these steps is a popular souvenir of the city. It’s not all about the steps of course! The Cathedral dates from 1038, when it was originally consecrated, and is built in both the Romanesque style and the Gothic Style. Inside, you’ll find the widest Gothic nave of any church in the world, which is just shy of 23 metres in width. 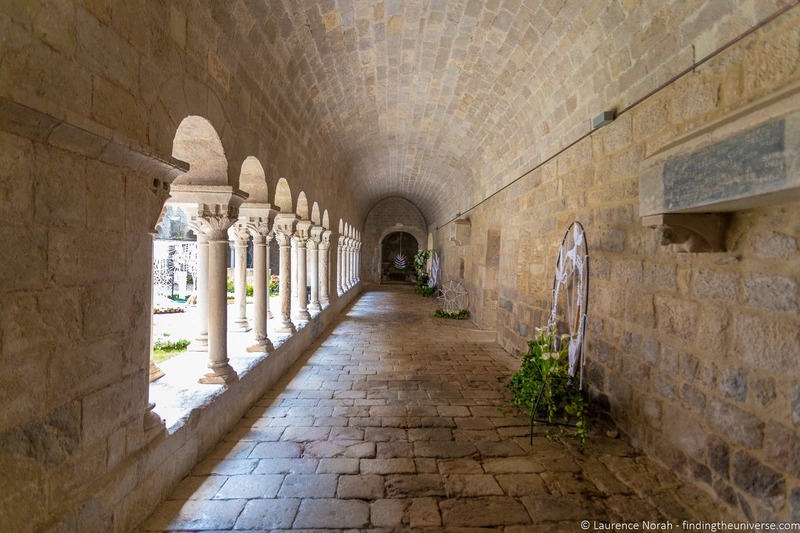 There’s also a beautiful Romanesque cloister which features columns with sculpted capitals, as well as a number of tombs which date from the 14-18th centuries. The church is also home to a museum and treasury, which is home to some important artefacts including the Tapestry of Creation, an 11th century tapestry which is widely regarded as one of the most impressive pieces of Romanesque tapestry. All in all, there is plenty to see here, and this should definitely be on your list of things to do in Girona! There is a fee to visit, but it does include an audio guide as well as the aforementioned Basilica de Sant Feliu. A short walk from the Cathedral are the Banys Àrabs, or Arab Baths. Dating from 1194, these baths were built in the Romanesque style, and are modelled after Roman baths, Turkish baths, and Jewish mikvahs. This is a beautiful space to visit, with the highlight in our opinion being the room where bathers would have undressed, known as the apodyterium. This has as its centrepiece an octagonal pool around which stand eight beautiful columns, atop which is is a dome through which the light pours. There’s a small entry fee to visit the baths, which is well worth paying. If the idea of a bath sounds appealing, you might want to visit Aqva, which is just around the corner from the Arab Baths. 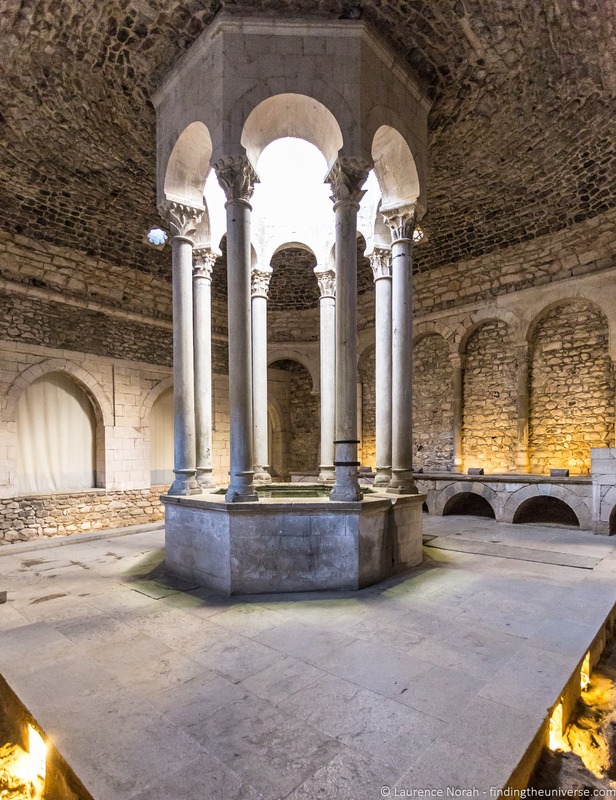 This spa / bath experience is found in the former hospital of Girona. Hospital in this case meaning a place of hospitality for strangers, rather than a place for sick people. The baths have been created in the ancient Greco-Roman style, and there are a variety of bathing and sensory experiences to be had here. We had a lovely time bathing here amongst structures which date as far back as the 5th century, and trying out the Tepidarium and Frigidarium. Note, this is experience is timed and you definitely need to book in advance if it is of interest. You can see more on the official website here. Fans of the TV show Game of Thrones have a treat in store when they visit Girona, as the city served as a number of filming locations for Season 6 of the show. Filming for the show was done in 2015 and took place at many sites around the city. 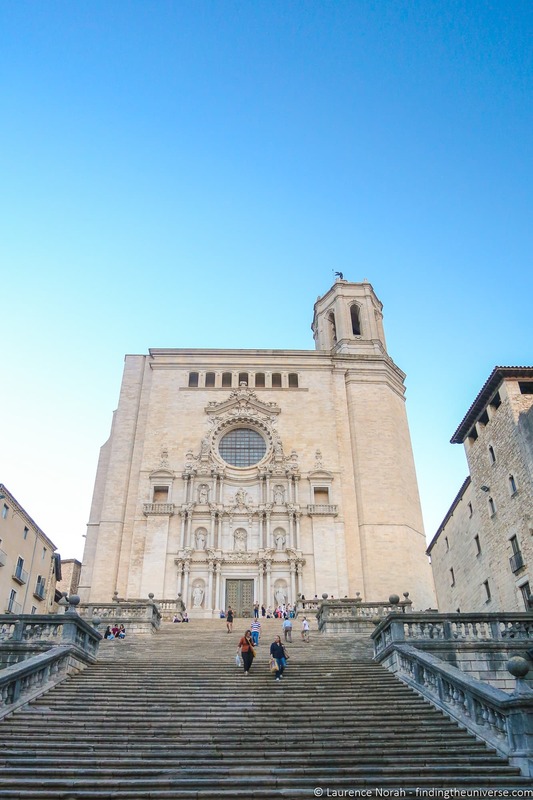 Most notably, the steps up to the Cathedral de Santa María de Girona was where Queen Margaery’s atonement was prevented from happening by Jamie Lannister. Other filming locations include the area outside the Arab Baths, the Monastery of San Pere de Galligants, and Plaça de los Jurats. If you want to visit the Game of Thrones filming locations, we can recommend taking a guided tour like this one to do so. This will help bring the scenes to life, and the guide will likely be able to share their experiences of what the city was like during filming. The Monastery of Daniel is about a ten minute walk from the centre of town, so you might not have enough time to visit this one if you’re on a shorter trip from Girona. If you do decide to visit it though, it’s closest to the Arab Baths on this list of things to do in Girona. Dating from the 11th century, the monastery was originally built as a nunnery. It has a beautiful two level cloister, and is open for visitors. Being set outside the city a little bit, in a lovely green valley, this makes for a nice change from exploring medieval city streets if you want to see a different side of Girona. 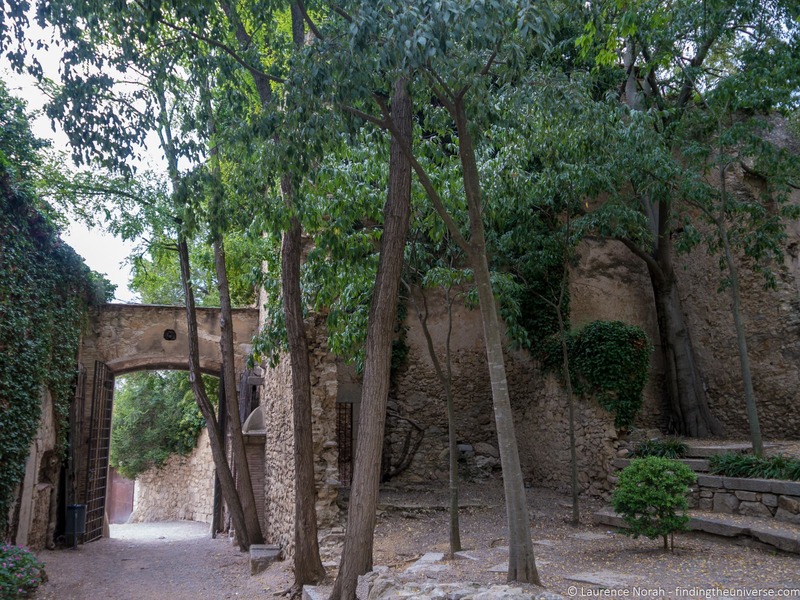 A little further up the hill from the cathedral, as you get closer to the long stretch of city walls, you will come to the Jardins del Alemanys. This free to visit garden area contains many trees and plants, nestled in amongst the old ruins of both the city walls and parts of the Roman city that was here (see the next stop for more on this). This was also where the barracks for the German soldiers who fought in the 19th century Peninsular War was located, and the ruins of these can also be seen today. This gave the garden their name, the “German Gardens”. Girona has been around for a long time. It was founded in 79BC, and when the Romans were building their empire, they dropped by and built a massive fortress here – Força Vella. This was enclosed by huge walls, which remained in place, unchanged, until about 1,000 AD. After that, as the city evolved and grew, the walls started to become absorbed into the fabric of the city. However, as you travel around the city, you will start to see evidence of these massive constructions around the city. One great way to get glimpses of this ancient fortress, as well as to get great views across the city in general, is to take a walk on the medieval walls. These walls, which date from the Carolingian period (around the 9th century AD), were an extension of the original Roman walls. They run from behind Girona Cathedral, in the Jardins dels Alemanys. You can walk along the top of them for wonderful views, and also pop up the lookout towers. This is one of my favourite locations in Girona to photograph the sunset, and is a wonderful spot for a stroll. As is hopefully becoming apparent by now, Girona is quite an old place. Parts of it date from over 2,000 years ago! One of the best places to really get a sense of this age is by taking a wander through the Jewish Quarter, also known as El Call. The name comes from the fact that there was a sizable Jewish population in Girona (and many other towns and cities across Girona), dating from at least 982. They paid higher taxes than other citizens, and were afforded special protection, but were expelled from the city in 1492. You can learn all about this history with a visit to the excellent Jewish History Museum, which is in this part of the city (more on this shortly). 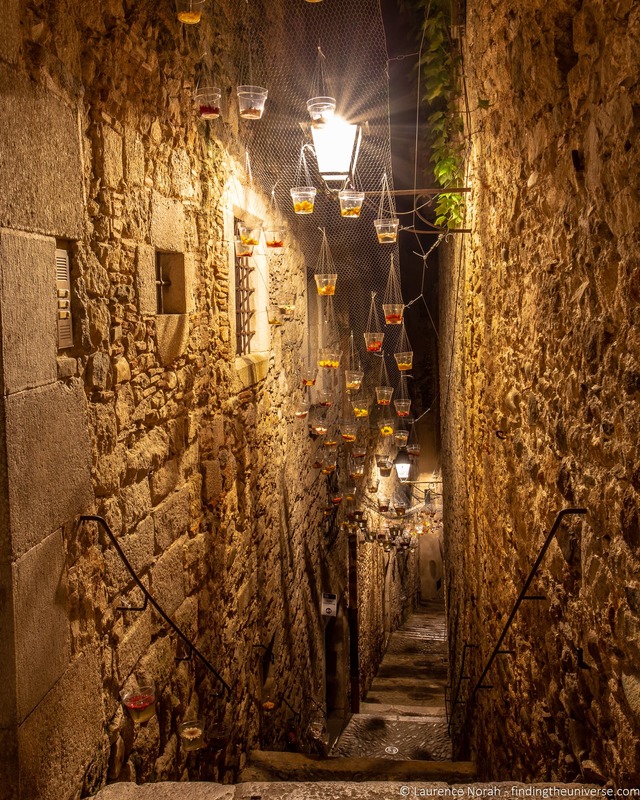 You will have already visited sections of this as you visited some of our must-see attractions in Girona, but nothing beats just setting off in a random direction down a twisting narrow cobbled street, and just seeing where your feet take you. Don’t miss Carrer de la Força (Carrer means street), which is home to the Jewish History Museum (see below). Other streets you might explore include Carrer Manuel Cundaro, Carrer de Sant Llorenç, and Carrer del Doctor Oliva i Prat. All of which are narrow and lined with old stone buildings and small, almost hidden doorways. If you would rather be guided through this area, it’s also possible to take a walking tour such as this one. This will take you through the medieval streets and your guide will share lots of information about the history of the city and its people as you go. See here for other options. If you want to learn a little bit about some of the history of the people and city, then you should visit one of Girona’s many museums. There’s an excellent choice in the city, and we’re sure that at least one or more of these will be of interest. If you’re visiting Girona on a day trip, you will likely only have time to stop in at one of these. If you’re in Girona for a few days, we can highly recommend visiting a number of them. We have visited all of these museums, and they all offer something different and interesting for the visitor. Note that if you visit more than one of the six Girona museums, you can take advantage of a 50% saving at all the museums after the first one. See more about getting those discounts here. 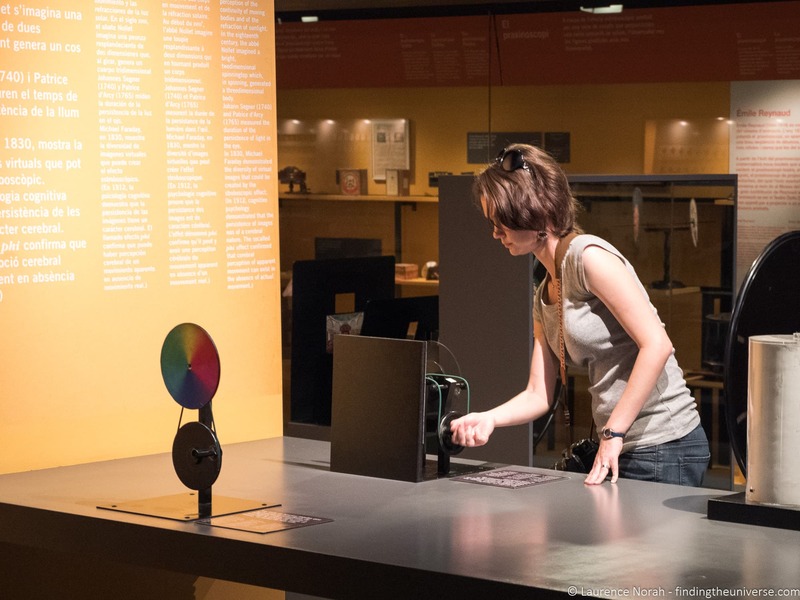 If we’ve piqued your interest in the Jewish history of Girona and Catalonia in general, a visit to the Museum of Jewish History will help sate that interest. 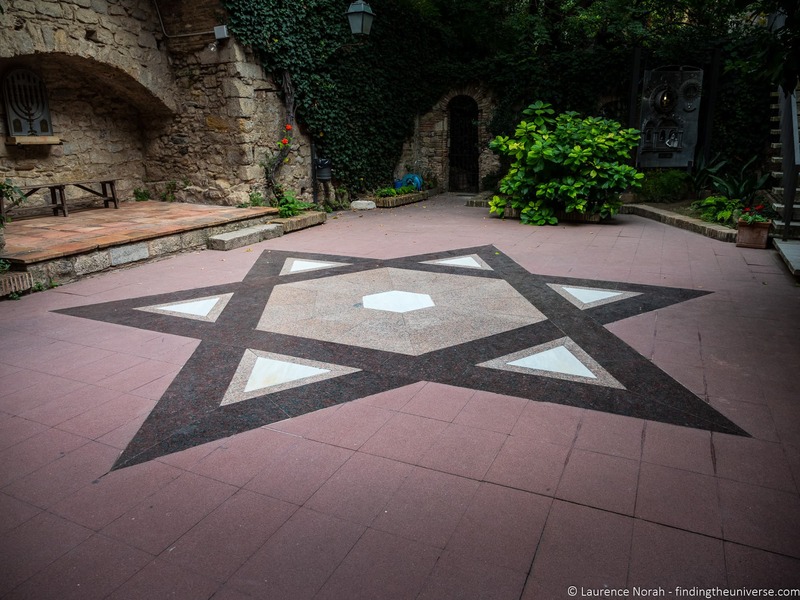 This museum, which is found inside Girona’s 15th century former synagogue, contains a great deal of information and artefacts relating to the Jewish history of the city and surrounding area. The Girona Art Museum is a treasure trove of art, home to the best collection of art in the Girona region. Pieces range from early Romanesque art through to 20th century art, and there are some truly spectacular pieces on display. One of our favourites, and a highlight of the collection, are the Gothic Altarpieces. These are found in the former throne chamber (the museum is found in the former Episcopal Palace, next to Girona Cathedral). The Girona Museum of Archaeology is found in the old Monastery of Sant Pere de Galligants (also a Game of Thrones filming location!). The museum has been sympathetically laid out to highlight the wonderful architecture and features of the building, whilst providing a fascinating overview of the history of the area. The collection and information covers everything from prehistory up to the medieval times, including objects made by prehistoric man, artefacts from the Roman period and Jewish tombstones. This is the oldest museum in Girona too – it was founded in 1846! An excellent museum in a beautiful building. To learn about the history of the people and city of Girona, you will want to visit the Girona History Museum. This museum, which is found in the former monastery of St. Anthony, covers a full history of the city from Roman times up to the present day, and is packed with exhibits, dioramas, and information panels. 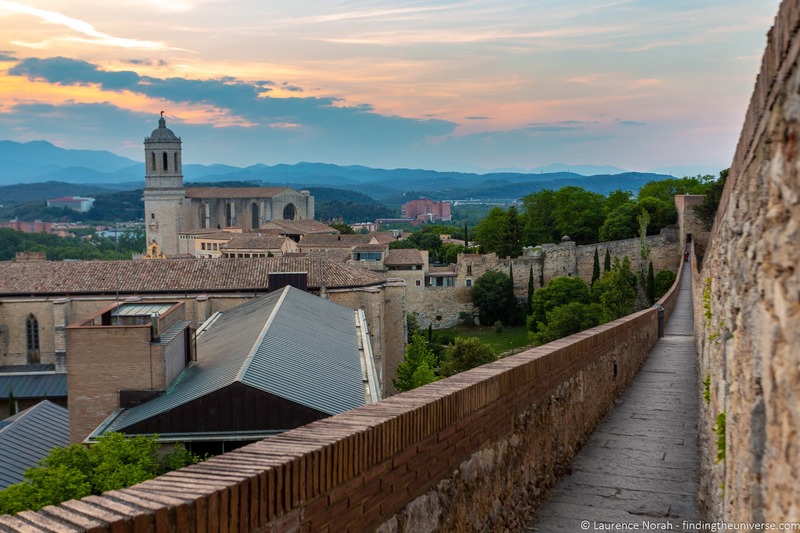 As with many of the other museums in Girona, the building it is in also lends to the experience, and the history museum also has a terrace with a lovely view of one of Girona’s main streets. Cinema and film buffs will definitely want to check out Girona’s Museum of Cinema. Opened in 1998, this was the first museum of its kind in Spain. A major part of the cinema’s exhibition centers around the Tomàs Mallol Collection, which Girona council acquired in 1994. These objects date from the pre-cinema and early cinema days and are a fascinating insight into the earliest days of motion picture entertainment, covering a 400 year period from shadow puppet theatre to more modern cinema technologies. There are also temporary exhibits on a wide range of related subjects, and the museum has won several awards for its exhibits and educational work. The last of the six Girona museums on our list to consider is Casa Masó. This is a little different to the other museums on our list, as it is a house museum which focuses on the life of one man in Girona. Casa Masó, or Masó House, was the home and birthplace of Rafael Masó i Valentí, one of the most famous Catalan architects of the early 20th century. Over his life, he made significant changes to the property, merging four houses into one and significantly changing its design. It’s now regarded as one of Girona’s most important works of architecture. It’s possible to visit this house, which is the only house along the river in the old town which is open to the public. Tours are by guided visit, and you will learn all about the architect and the home on the informative tour. Moving on from museums now, and on to the Pont Palanques Vermelles (also known as the Pont de les Peixateries Velles, or Pont Eiffel). In English, this is commonly known as the Eiffel Bridge, and it’s a foot bridge across the river constructed out of impressive iron latticework. The bridge was built and designed in 1877 by Gustave Eiffel, the French engineer who went on to build Paris’s famous Eiffel Tower. That was constructed somewhat later, in 1889, but you can see the similarity in the design with the lattice work and material. Fun facts aside, the bridge is a lovely place to get views up and down the river of the Girona skyline and the colourful houses. The view north, or down the river, is particularly nice as you can see the pretty houses of the old town, as well as the towers of the cathedral and church. Somehow we’ve got this far into our guide to things to do in Girona and not managed to mention food. It’s time to fix that. If you have time to eat in Girona, there’s no shortage of locations to do so – see our suggestions on some local dishes to try below. 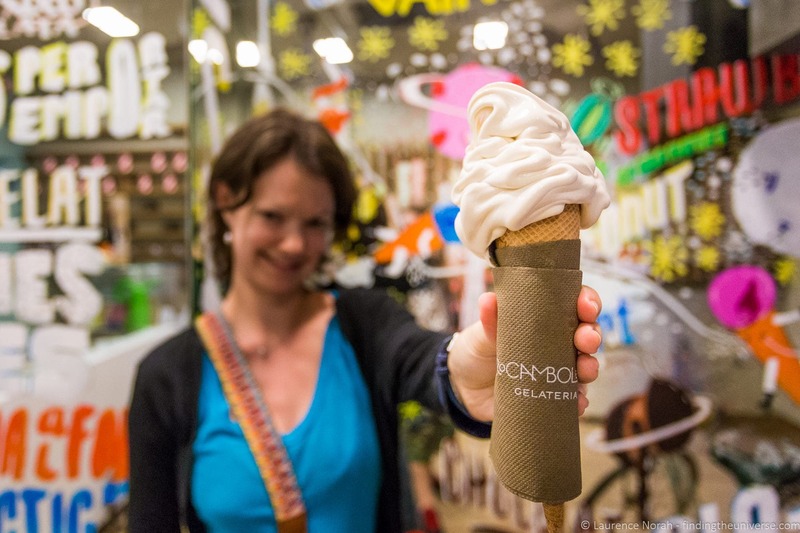 However, if you have less time, or want to really treat yourself, then you have to visit the Rocambolesc Ice Cream shop. This is operated by the people behind the El Celler de Can Roca restaurant, which has been named the best restaurant in the world on a number of occasions. As you might imagine, the ice cream is pretty incredible, and they have some pretty fantastic flavours to choose from. Plus, unlike the restaurant, you don’t have to book months in advance to secure a table! Ok, so let’s talk about some food options. The Costa Brava region has some fantastic local specialities, with dishes including fresh fish from ports like Palamós, as well as mushroom, vegetable, rice, and meat dishes. 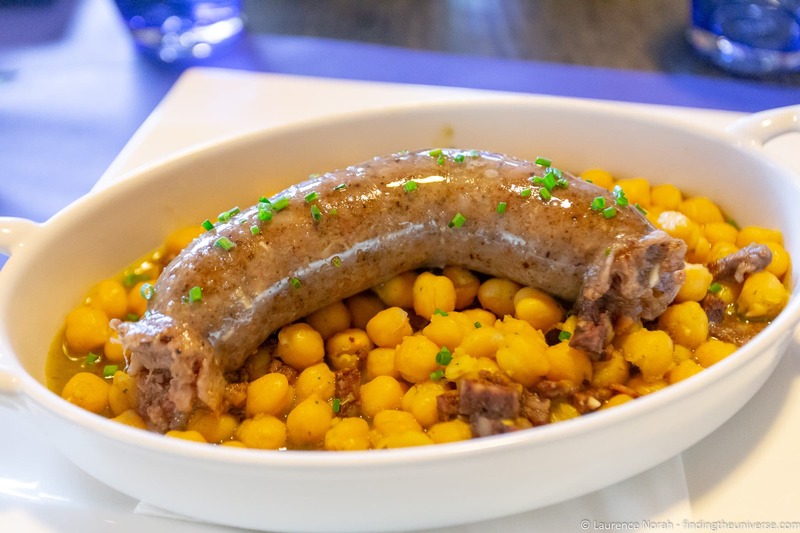 One of my personal favourites (it’s not for everyone though) is botifarra, a type of sausage that is based on an ancient Roman recipe This is often served grilled with white beans, and will likely appear on a menu as botifarra amb seques or botifarra amb mongetes. Another popular dish, which is served with many meals, is bread smeared with tomato and oil (Pa amb tomàquet). Often at breakfast buffets there will be bread, tomatoes and oil provided for you to make your own. Other highlights to look out for are Catalan style cod, rice dishes, patatas bravas, and crema catalana, a yellow cream served for dessert which is similar to a crème brûlée. Xuixo is another popular dish that is local to Girona, it’s a deep-fried sugar coated pastry which is filled with crema catalana, and is as delicious as it sounds. We’ve also always enjoyed eating at Cafe le Bistrot, which has a fantastic outdoor seating area on the stepped street leading up to the Església de Sant Martí Sacosta, and is a lovely spot for an evening meal especially. 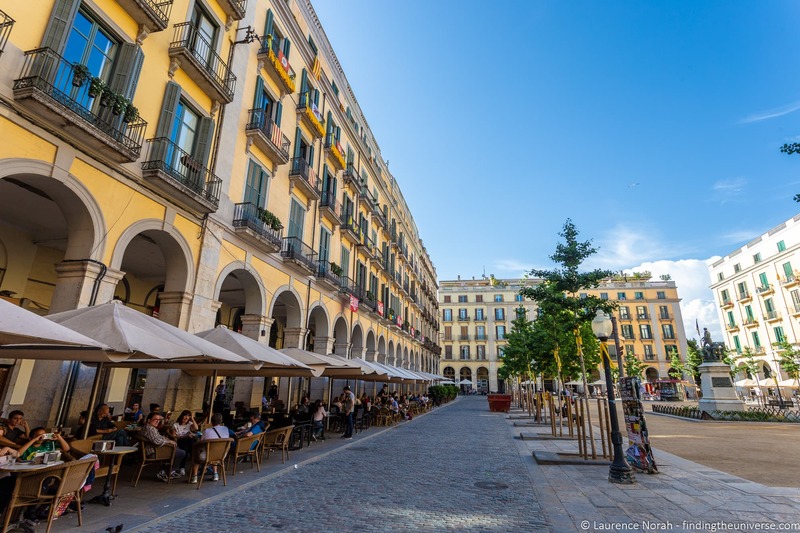 If you’re just after a drink, snack or a coffee, there are some nice places in the below Plaça de la Independència. We can also recommend Espresso Mafia and La Fabrica from personal experience for excellent coffee. The majority of our guide to things to do in Girona has covered the old part of town, but there’s a lot more to the city to explore, especially if you have a bit more time to explore. One easy to visit location is Plaça de la Independència, one of the most popular and lively squares in the city. The square is popular with both locals and visitors, largely due to the many restaurants that run around the perimeter of the square in the covered portico areas. It was constructed in the 19th century in the neoclassical style, and makes for a lovely contrast to the winding old cobbled streets of the medieval area. It’s a great place to grab a bite to eat or a large gin and tonic, and watch the world go by! 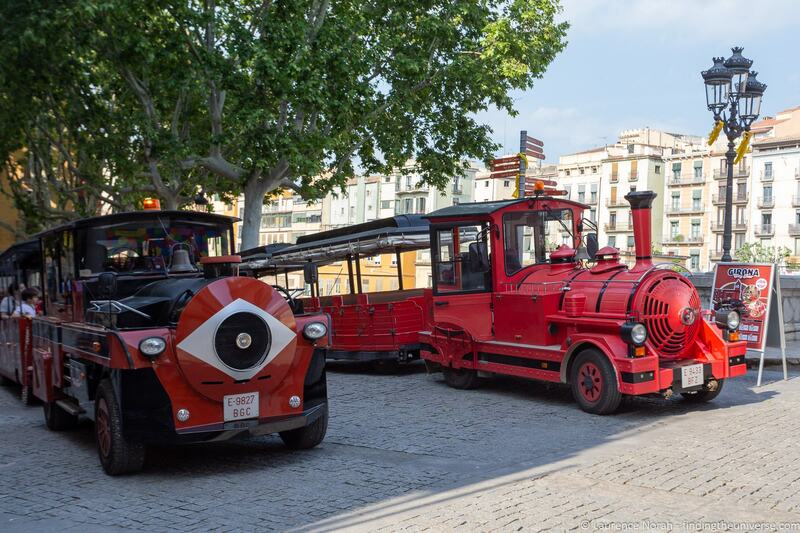 If you want a tour of the city that involves minimal walking, you might consider taking the Girona tourist train. This is a 30 minute ride around the more accessible parts of the city, and there is an audio guide in a number of languages. You can purchase tickets in advance here. Girona has no shortage of places to shop, but if you want to see where the locals go to get their fresh food (and other items! ), we can recommend a visit to the Mercat Municipal del Lleó. 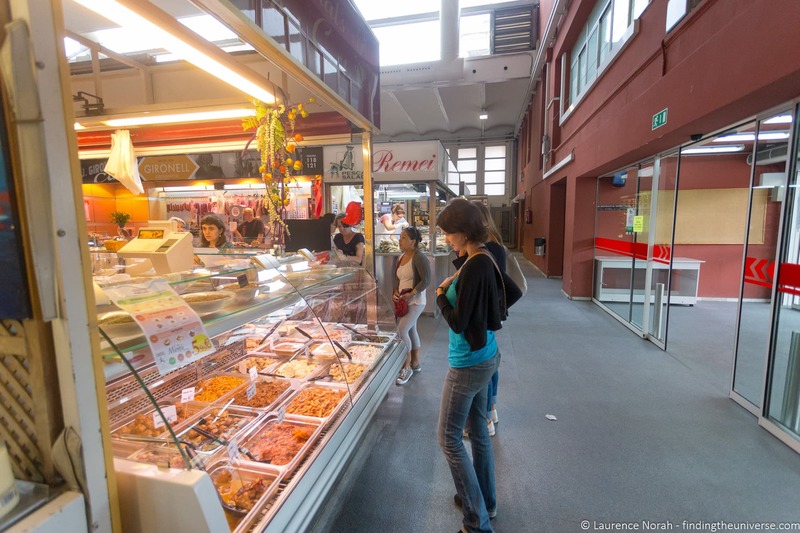 This is home to over 50 shops selling everything from fresh vegetables to meat and fish. It’s open Monday – Friday from 7am – 2pm, Friday afternoons from 5pm – 8.30pm, and Saturdays from 7am – 2.30pm. Closed on Sundays. See more information here (in Catalan so you’ll need to translate it!). We were particularly impressed by the vending machine that sold premium extra virgin olive oil by the can, although that might just have been us. Of course, there are many other markets in the town, and stalls selling jewellery and other items can be found in various locations. A good spot for this sort of stall is the Pont de Pedra bridge, which connects the old town with the Mercadal neighbourhood. Other markets include the craft and artisan food fair in Plaça Miquel Santaló, and La Volta Market in Assumpció square. Girona, and the Costa Brava / Pyrenees region in general, is home to multiple festivals throughout the year. These celebrate all sorts of things, from the patron Saint of Catalonia (Sant Jordi), through to music festivals, light festivals, and flower festivals. 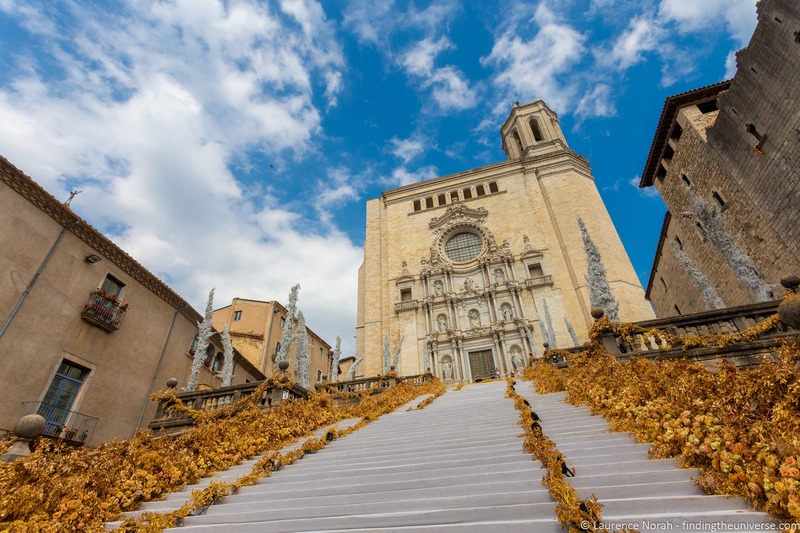 The last time we were in the Girona the city was bedecked with flowers for the Temps de Flors, the annual Girona flower festival, which happens every year in May for ten days. This is an amazing (and popular!) event in the city, with tens of thousands of floral arrangements and art installations spread throughout the old town. 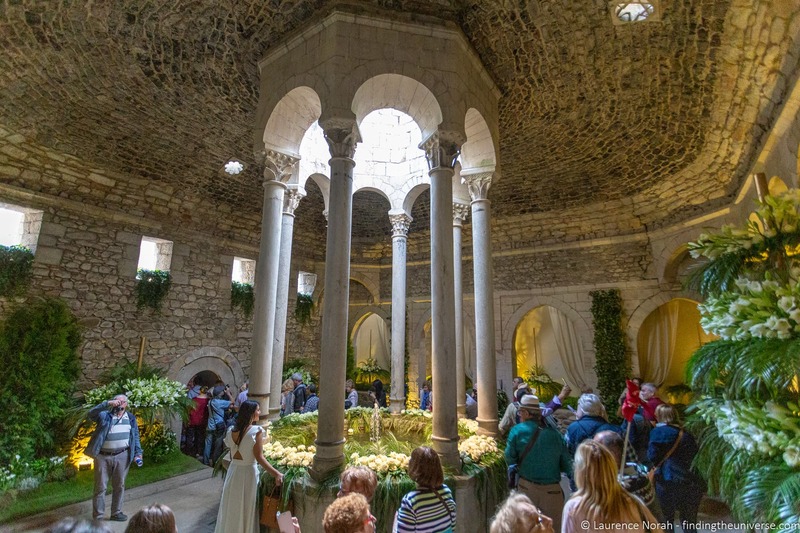 It’s worth being aware that events like the Temps de Flors bring in thousands of extra visitors so be sure to book lodging well in advance if you are visiting during one of these events in Girona. 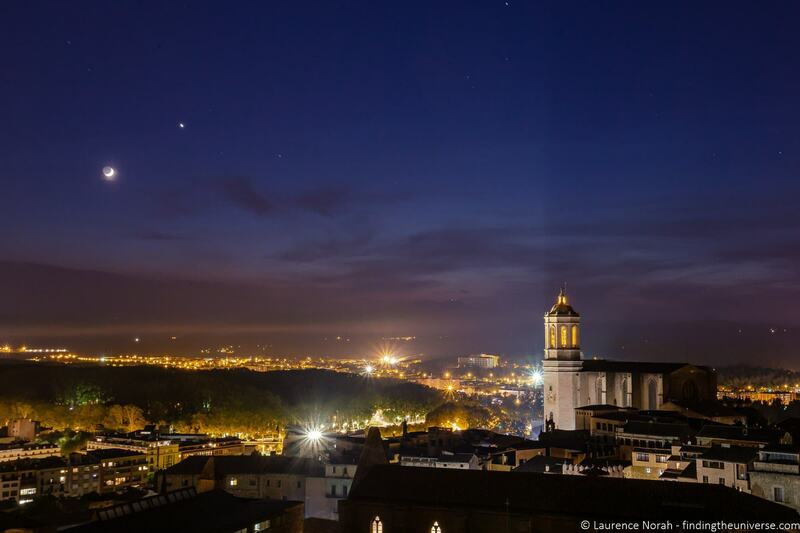 There are lots more events throughout the year, check out the Girona events calendar for more. The last thing you have to do before you leave Girona is kiss the lion! Don’t worry, it’s not a real lion. 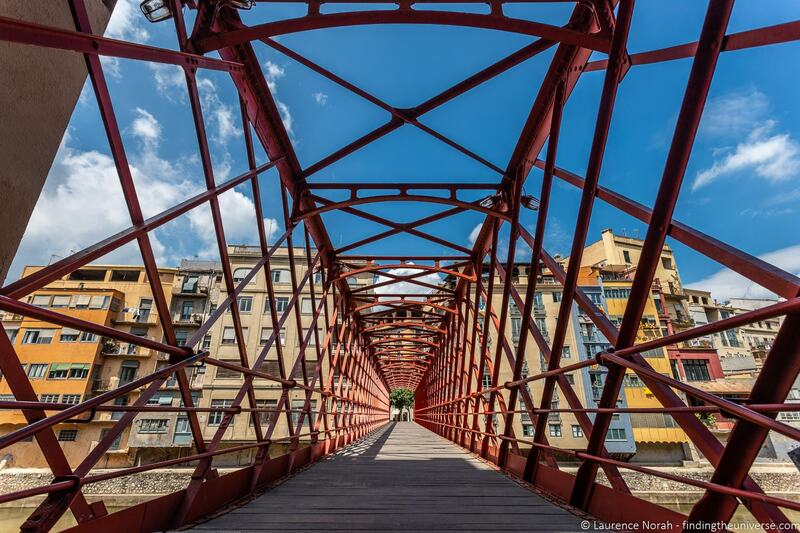 By the Pont de Sant Feliu, near the steps up to the Basilica de Sant Feliu, you’ll find “El Cul de la Lleona”. This is a column with a lion statue at the top, and the saying goes that if you kiss the buttocks of the lion, you are guaranteed to return to the city. We have kissed it, and we have returned many times, so this clearly works. Note that this is not the original lion statue, it’s a replica. The original can be found in the city’s Museum of Art, and we’d advise against trying to kiss that one! We’ve put together a map of our favourite things to do in Girona, which you can see on Google Maps here for quick reference. Pretty much the only way to get around the medieval part of Girona is on foot. The streets are narrow and cobbled, and whilst there are a couple of routes that are accessible by car, this is generally not advised. 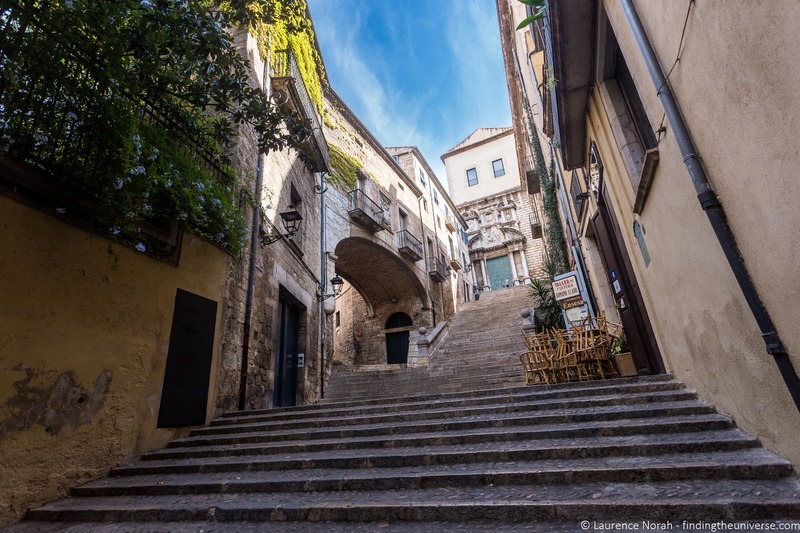 Parts of the city are accessible for those with reduced mobility, but you will need to plan your route carefully, as there are many areas with steps throughout the city and many of the medieval streets are cobbled and steep. Another option is to look into the tourist train as an option, which is accessible. Girona is not the best city for wheelchair users so do check ahead before you plan to visit. See the official tourism site on accessibility here. Girona is very well served by transport links, both from within Spain and from abroad. Here are some of the most popular ways to get to and from the city. Girona is very well connected to the rest of Spain and Europe by train. A high speed service operates from Girona to Barcelona, and it takes under an hour to get between the two cities. From Barcelona, you can then connect to other cities across Spain, such as Madrid, which is around 3 hours from Barcelona. Girona is on the main train line that connects to France, and you can take a fast train from Girona all the way to Paris, getting you to the French city in under six hours. For tickets, take a look at the Trainline’s booking site. 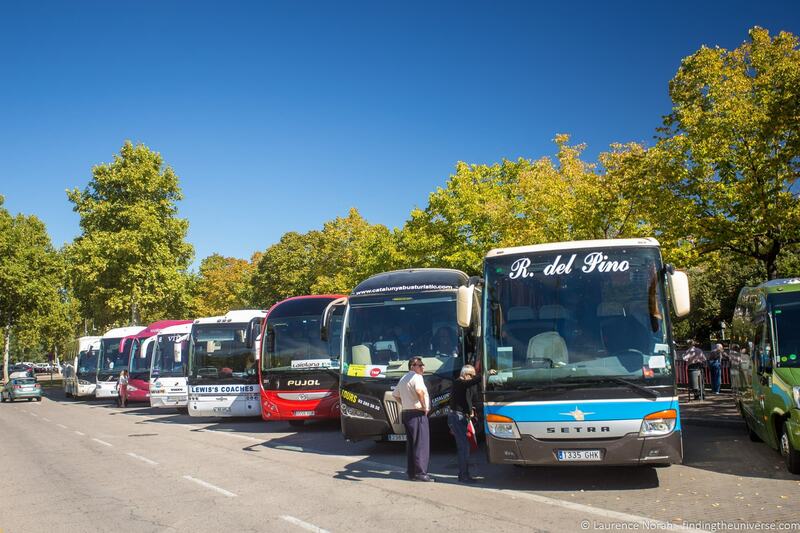 There are also bus connections from Barcelona to Girona, as well as other major towns and cities in the area. The bus from Barcelona takes just over an hour, depending on traffic and time of day. See bus times and book tickets here. Girona is easy to reach by car, as it is close the AP-7 – the main road which connects Barcelona with France. This is a toll road, meaning you have to pay to use it, but this also means it’s a fast road. From Barcelona, it’s around an hours drive, whilst from Barcelona Airport it’s around 1 hour and 20 minutes, assuming low traffic. It’s also possible to drive between Barcelona and Girona and avoid the toll road, but expect to add at least 30 – 45 minutes to your journey. In terms of driving in the city, this is not advised in the old town, and most of it is inaccessible to cars anyway. Instead, you’ll want to find parking (this can also be a challenge!) outside the city somewhere, and walk in. 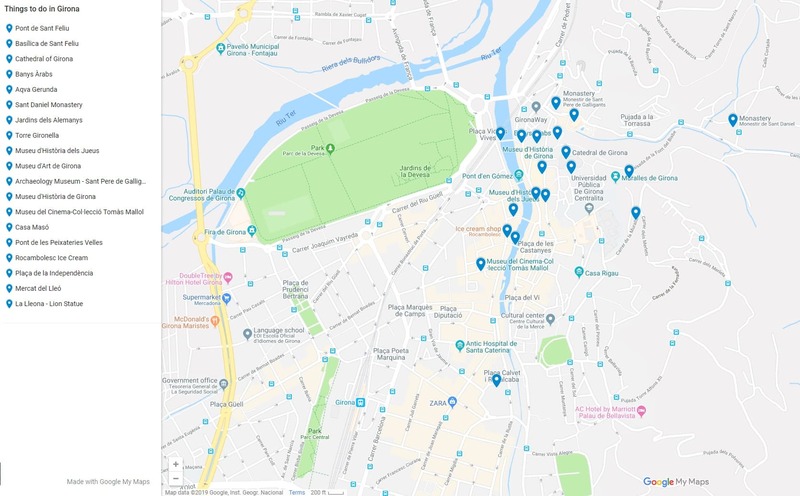 The major hotels we recommend will have parking (this is often at a fee), but apartments and smaller hotels in the old town may not, so factor this is when travelling here as you may have to move your luggage some distance, and plan ahead as to where to park your car. Girona has its own airport, the Girona-Costa Brava airport (code GRO), with flights to and from cities across Europe. The airport is south of the city, with various transport options into Girona available, including an airport bus, rental cars and taxis. The major international airport in the area is the Barcelona El Prat (BCN) airport. This offers flights to destinations around the world, and from here it is easy to get to Girona by one of the previously mentioned options. One of the most popular ways to visit Girona is on a day trip from Barcelona, which was also the first way that I visited the city. 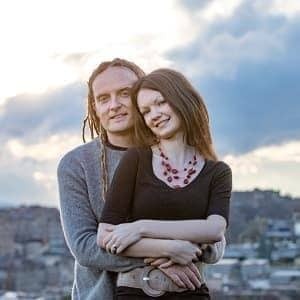 There are a great many tours to choose from, here are some options to consider, depending on what you are interested in. A full day 10 hour tour of Girona – a good option for giving you more time in the city. Also includes a Game of Thrones walking tour option. We have stayed in Girona a number of times at a variety of hotels and apartments. There are plenty of both of these options to choose from, depending on your preference and budget. Here are some suggestions. Hotel Carlemany – This 4-star hotel is found just a few minutes walk from the old city. Hotel Carlemany is a lovely hotel with secure on-site parking, lovely rooms and a good on-site restaurant. We enjoyed staying here. 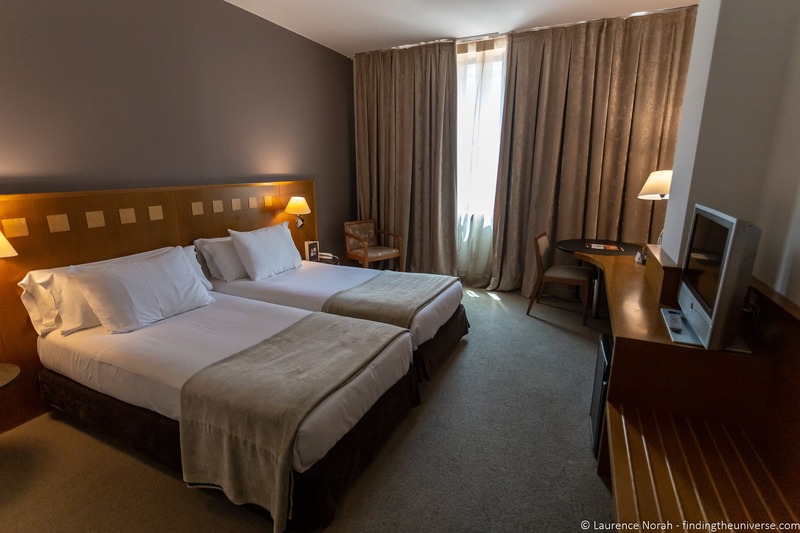 Hotel Ciutat de Girona – Another of our favourites in Girona, the 4 star Hotel Ciutat de Girona is also just a few minutes walk from the old town, and is very close to Plaça de la Independència. On-site parking and a great restaurant. Pensión Borrás – Travellers on a budget will appreciate this guest house, which is located in the heart of the old town. For apartments, as well as booking.com, we also use and recommend AirBnB. If you’ve not used AirBnB before, this link will save you up to $100 off your first stay. See their listings for Girona here. We’ve been lucky enough to visit the Catalonia region a number of times, including time spent in Girona, the wider Costa Brava region, Barcelona, and the Pyrenees. We’ve also visited in winter for fun winter activities like skiing, and in the warm summer months for the beaches. We’re actually heading back again in a few weeks so also adding new content on this region! As you might imagine, we’ve written a great deal of content to help you plan your own trip to the area, and we wanted to share some of these guides with you so you can find them easily. 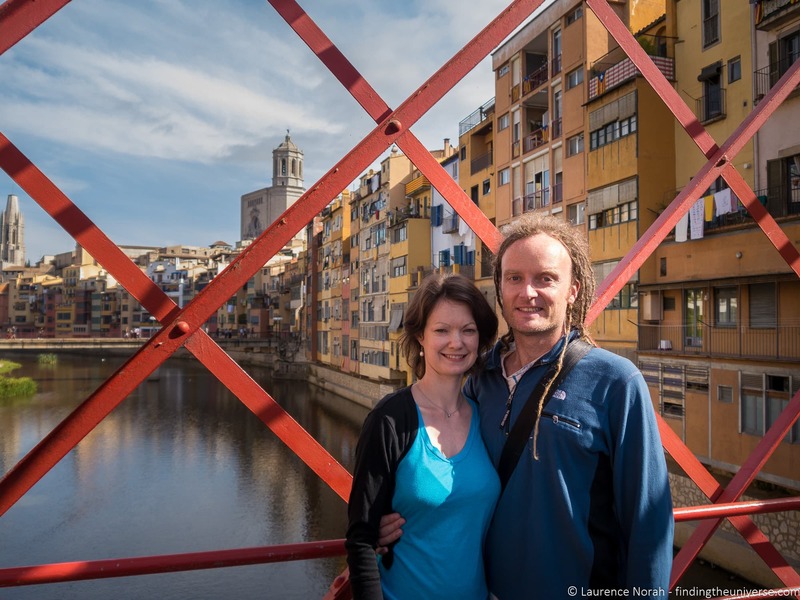 Our first visit to Girona was on a day tour from Barcelona, you can read about that day trip experience here. Lovers of surrealist artist Salvador Dali will want to visit some of the many sites associated with the artist in the region. See our guide to Dali Sites in Costa Brava that lists all the attractions to help you put together your trip. If you love mountains, you’re going to want to spend some time in the Spanish Pyrenees region of Catalonia. See our guide to the Spanish Pyrenees to start you off. If visiting in the winter, you might consider heading to one of the Girona region’s ski resorts, and you can take a look at our guide to skiing in the Spanish Pyrenees. We also have detailed guides to all the specific regions of the Girona Pyrenees of Catalonia, including La Garrotxa, El Ripollès and La Cerdanya. We also have a guide to visiting the Vall de Nuria. And that’s it for our guide to our favourite things to do in Girona! As always, we’re happy to hear your feedback and answer any questions. Just pop them in the comments below. So you know, we have been supported on many of our trips to Girona and Costa Brava by the Patronat de Turisme Costa Brava Girona, who generally cover our expenses, including accommodation, car hire and attraction entry. All opinions remain our own – you can see our code of ethics for how we choose who to work with and what that means. Thank you so much for the article, I followed some of your recommendations and we had a good day here in Girona. Thanks Miguel – that’s great to hear!